A new light has begun to shine in our world. His name is Marshall Ball, and he writes with a grace and wisdom that will leave you warm and smiling. If you enjoy this bit of Marshall's work, please pass this URL on to your friends. to happily manage near perfection. Teaching Good gives great love purpose. Marshall Stewart Ball is, by all counts, an extraordinary young man. Born with developmental challenges, he cannot speak, nor can he walk independently. He does not have the strength or fine motor control to use a computer without assistance. To write, Marshall must have his elbow supported as he points to individual letters on an alphabet board. Marshall's strength in the face of his daunting challenges is a reflection of his desire to share his message with others. His infinite capacity to give and receive love is evident to all who meet him and to all who read his words. Marshall's web site is at www.marshallball.com. 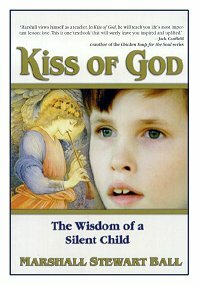 These excerpts from Marshall's book, Kiss of God, are published here with his permission. When I asked his permission, he replied, "Marshall feels like the book will bless many. Take it to a good audience." Thank you, Marshall. I receive no monetary benefit from the sale of Marshall's book. I recommend it only so that you may share the joy it has brought me. It is available many places including Amazon and Border's. for poetry and quotes on friendship, visit A Quiet Corner. please visit my main website at MsTeri.com.